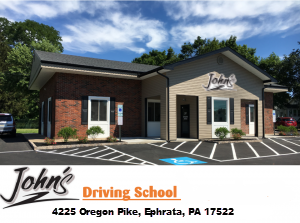 John’s Driving School now services Ephrata, PA and its surrounding areas! At John’s Driving School, we provide instruction in the art of driving to young adults and adults in Lancaster County, PA. With more than 40 years of experience in teaching the serious business of driving throughout Pennsylvania, our personalized course will teach you how to become a safer, more confident and more experienced driver. Please note that all of our services may not be available through this location. Call us today at (717) 287-8300! SOME AREAS OF LANCASTER MAY BE PART OF OUR EXTENDED SERVICE AREA. PLEASE CALL FOR MORE INFORMATION. SOME SERVICES MIGHT NOT BE AVAILABLE THROUGH THIS SECTION. Learn more about our driving packages and prices by clicking here. Make an appointment today by calling (717) 287-8300! The following zip codes are included in our normal service area: 17501, 17505, 17506, 17507, 17508, 17016, 17517, 17519, 17520, 17022, 17521, 17522, 17528, 17529, 17533, 17534, 17535, 17537, 17601, 17602, 17603, 17538, 17091, 17540, 17543, 17545, 17549, 17552, 17554, 17555, 17557, 17073, 17562, 17564, 17567, 17569, 17572, 17573, 17575, 17576, 17578, 17579, 17580, 17581, and 17585. The following zip codes make up our extended service area: 17003, 17503, 17504, 17008, 17010, 17512, 17312, 17313, 17317, 17318, 17322, 17527, 17104, 17105, 17111, 17113, 17122, 17126, 17140, 17033, 17034, 17036, 17041, 17042, 17046, 17042, 17342, 17057, 17064, 17347, 17067, 17560, 17077, 17078, 17083, 17568, 17085, 17570, 17087, 17088, 17582, 17583, and 17584.